Many folk in and around Alexandra (pop. 5440) were up in arms when a Christchurch-based firm called Skybase sought to restrict more than 500 sq km of Central Otago airspace in which to test unmanned aircraft. We do not know how many untested UAs are owned by Skybase in New Zealand, but we do know that Skybase is backed by US interests. We know next to nothing about Skybase’s local research and development of UAs, because Skybase has said little about it, while its publicity mentions the alleged benefits that testing will lead to, for all of us. Skybase is claiming it will produce a Public Good while not acknowledging its primary goal, which is to make money. For Skybase, this is critically important, because restricted airspace cannot be granted for private gain – unless that profit can be proved beyond doubt to be less important than the public benefit. More than 70 submissions were received by the CAA before the closing consultation date but, only hours before that deadline, Skybase withdrew its application. The GAA believes – in the absence of any evidence to the contrary – that all the submissions opposed the application. The GAA also understands from a reliable industry source that not one of this country’s aviation organisations supported the Skybase application. Now that Skybase has retreated from its first attempt, the CAA must consign all those submissions to the waste paper bin. Now Skybase says that it will mount a second attempt. So everyone who opposed Skybase must submit a new submission. We hope they will, if only to oppose the notion of unelected bureaucrats being able to give away public airspace for private profit. When it cancelled its application, Skybase said that it was taking a more forensic approach to locals in Alexandra and was offering a Memorandum of Understanding. Let’s make this clear to Mr Ferguson: Skybase was totally unclear about its intentions; its behaviour was a public relations disaster; and Skybase must tell the people of New Zealand precisely how (preferably in dollars and cents) its work will benefit them. The GAA has seen the Skybase draft MOU and you can read it here. It amounts to nothing more than a confidentiality agreement including an Annex showing a revised proposed restricted area, along with terms and conditions that no one in their right mind would sign. The MOU and its Annex would commit a signatory to say nothing in public, including comment on anything in the Annex. It contains wording that implies approval of Skybase’s proposed activity. It makes the signatory complicit in whatever use Skybase might put to the restricted airspace, without being told anything about the intended end-use of such testing. 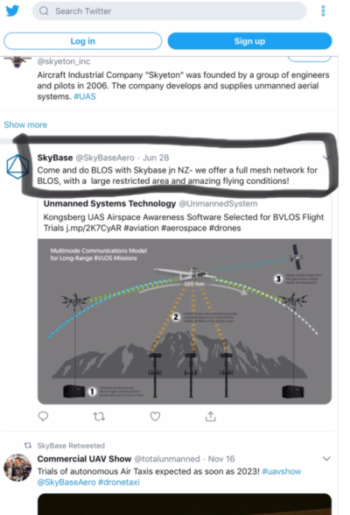 Skybase has said almost nothing about its US backers, so you could ask: Is it possible that test results from Skybase – or, for that matter, anyone else testing UAs in New Zealand – could be used for military purposes? You might also ask why New Zealand has become an attractive location for testing UAs, particularly since some of these aircraft may have a maximum take-off weight of more than three tonnes. Such an aircraft will not offer a public benefit such as delivering your pizza or the selfie stick you bought on Amazon. Such an aircraft, on the other hand, might put top-dressing pilots out of a job. Such an aircraft’s automonous derivative may be able to kill people, or spy on you. Why would the US-backers of Skybase ship unmanned aircraft thousands of miles to test them in New Zealand, rather than proving them in Arizona? The answer may lie in our poor liability legal regime, which has its roots in the Accident Compensation legislation. We still know nothing about the public liability insurance obligations that should be required by the CAA of any controller of restricted airspace for such tests. And yes, we have asked the CAA… and, yes, we are waiting for an answer. Last year, we saw the CAA grant a large area of temporary restricted airspace around Hokianga to a private company named Paua Interface Ltd. The CAA subsequently admitted that it had given approval without any public consultation. This was for a six-month trial, beginning in June 2017 and ending in December 2017. As far as we know, this restricted area, called R191, was not activated by NOTAM or used for UA flights during the trial period. On 1 August 2017, a new company was registered under the name Incredible Skies Ltd. The firm is part of the Maori-financed Paua Enterprises and a new application by Incredible Skies was filed for the R191 restricted area around Hokianga. The CAA says that “lack of resources” (which means lack of staff) has led to delays in the next steps of the consultation process. Incredible Skies has a website promoting its lapsed restricted airspace to overseas companies seeking to test UAs. Incredible Skies appears to be a money-making exercise. It has an executive person who claims that Incredible Skies owns five drones and has research facilities, but provides no detail about what kind of drones it owns, or what it is researching. It apparently did not use any of its five drones during the time it held control of restricted airspace R191. We could be forgiven, from reading the Ministry of Transport’s “Taking Flight” document, for believing that the Labour-led government thinks UAs will deliver thriving, innovative and allegedly enormous public dividends. This document still lacks the promised introduction by Transport Minister Phil Twyford. It, more importantly, requires workings to prove the claims. To convince New Zealanders, we must see the arithmetic. We have seen, in Hokianga and Alexandra, the troubling effects such applications have on communities and aviators. They are bound to react in the face of opportunist attempts to subvert their customary rights on the ground and above. Experimental UA activity in New Zealand airspace must not take place unless the originators promise, and can prove, that the results will never be put to any use that might harm people. Restricted airspace suitable for testing UAs already exists in New Zealand. It is controlled by our Defence forces. Ohakea and Waiouru are covered by restricted airspace far larger than those covered by the Alexandra or Hokianga areas. There seems to be no need to introduce additional restrictions on Class G airspace. The existing military restricted areas are not fully used; but they are tightly controlled airspaces where the Government could concentrate the activities of UA researchers, monitor them and directly derive from them some public revenue. Privatising public airspace is not the prerogative of the CAA. The Authority is merely the servant of politicians and the public. If restricted airspace in Hokianga, or Alexandra or anywhere near you is approved for private profit, you could blame the CAA Director. However, the real culprits live just over the road from his office – in the Beehive.